Insider's Update: Luke's going to Disney World, Small World at 50, and the fishes are organizin'! Though this will be Hamill's first appearance at Star Wars Weekends, he has appeared at Walt Disney World before, as evidenced by this photo posted by @Stingray_travel. Disney also announced this week that it will be celebrating the 50th anniversary of It's a Small World on April 10. The theme park industry's most famous earworm debuted at the New York Fair in 1964 before moving to Anaheim's Disneyland in 1966. 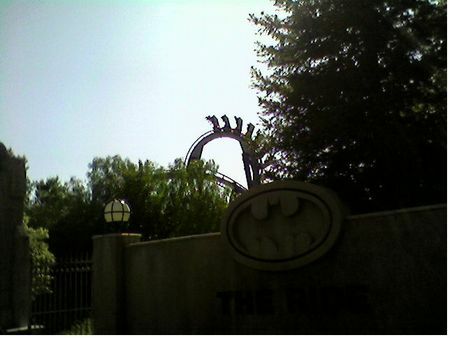 Copies of the ride now appear at Walt Disney World's Magic Kingdom, Tokyo Disneyland, Disneyland Paris, and Hong Kong Disneyland. Fans can visit SmallWorld50.com to record themselves singing the Sherman Brothers' famous theme song, or to build their own Mary Blair-inspired Small World virtual doll. Disney will donate up to $250,000 to UNICEF as part of the celebration, in recognition of Small World's original role as a tribute to the United Nations' aid and relief fund for children around the world. Six Flags Magic Mountain is sending two of its popular roller coasters backward for a limited time this spring. Batman The Ride and Colossus are making the switch, starting this weekend. Apparently inspired by all the Finding Nemo stuff they saw young Disney fans bringing into their restaurant, the tropical fish of T-Rex in Walt Disney World's Downtown Disney recently attempted their own spectacular escape. Restaurant employees responded quickly, however, capturing the fish and returning them to other tanks in restaurant. The fish are said to be trying to obtain a copy of DreamWorks' Chicken Run to help them plan their next escape attempt. Editor's note: On Saturdays going forward, I will be writing "Insider's Update" round-ups of news items from the Disney and Universal theme parks, as well as other major parks in Central Florida and Southern California, that didn't make it into their own Blog Flume posts during the week. On Wednesdays, Jeff Elliott will be returning to the front page with his round-ups of news from other parks "Beyond CaliFlorida," as well as other quirky stories of interest to theme park fans. March 22, 2014 at 11:51 AM · Bravo to regular weekly updates from Robert & Jeff. March 23, 2014 at 10:43 AM · I have to wonder about the timing of Mr. Skywalker himself coming to Star Wars Weekends, considering all the talk about a Star Wars land at Hollywood Studios. Curious if perhaps they will have him break the news on their plans for the park's expansion or upgrade. It sure would be awesome to have Mark Hamill announce it. Otherwise, it's just cool that he's agreed to show up. March 23, 2014 at 9:05 AM · While I think it is pretty awesome for Mark Hamill to come to Star Wars Weekend, why not do the autographs? He came all this way, why not? Plus, he has done the whole autograph thing in the past. March 23, 2014 at 10:43 AM · I really hope that Jeff can keep the tone and spirit you set Robert with this "Insider's Update". You strike the perfect balance between giving us news and adding just the right amount of humor. Your jokes are always funny too, like the ones you did about the Nemo escape at T-Rex. I'm hoping that Jeff can use the "Beyond CaliFlorida" column to give us some great information but keep the jokes in the fun and positive realm that you do and not go into any dark places. You have such a great, fun site. I enjoy reading it and like when the other contributors strike the upbeat, informative, and often humorous tone you personally set. One of the things I love about theme parks is how they bring together such a huge, diverse group of fans -- people who might not agree about anything else in life, except that they love theme parks. That's why I decided more than a year ago that I needed to get more voices on the TPI front page. My voice alone couldn't represent the wide diversity of theme park fans. So I don't want Jeff to sound like me. Nor do I want Russell, or Amanda, or Krista, or Jim to sound like anyone other than themselves. Of course, this will lead to situations where some readers might not feel a connection with some voices on the site. That's why I want to have many voices here -- to increase the chances that everyone will feel a connection with at least someone writing in our community. That said, and now this is for everyone reading, if you don't see a voice that you really want to hear on Theme Park Insider, maybe you could be that voice? I'm always looking for people with smart, well-informed takes on parks to help us cover what's happening and help other readers plan the best possible vacations. Email me if you're interested. March 23, 2014 at 6:20 PM · Robert -- I think you have a wonderful collection of contributors and what they all seem to have in common is that their love of theme parks comes through in what they write and that when they write an article it's about something they love or ideas they have about how things could be better, but it's always in such a positive and upbeat light. A few times, an article or two has appeared on TPI that didn't seem to come from this positive place of love but instead from a darker place. Grousing about how much things cost, working in some pretty dark and violent imagery and calling it "jokes". On one hand there's the concept of having a diverse groups of voices (which is wonderful) but is it really "diverse" to have one voice that goes to such dark places? I'm looking forward to seeing the "Beyond CaliFlorida" column because I think it has great potential. I just hope it's not a litany of things the writer hates about life or various parks and it doesn't go to the dark places of some past articles. March 23, 2014 at 6:50 PM · Annette: Could you please lay off your Jeff bashing & whining. It's getting really old and irritating. We kind of got your point of view concerning "dark forces?" and "negativity" after the first dozen or so anti Jeff remarks.